Balanced experience or User experience, what will be the right name? User exists only because of business, and business exists or grows by happy users. 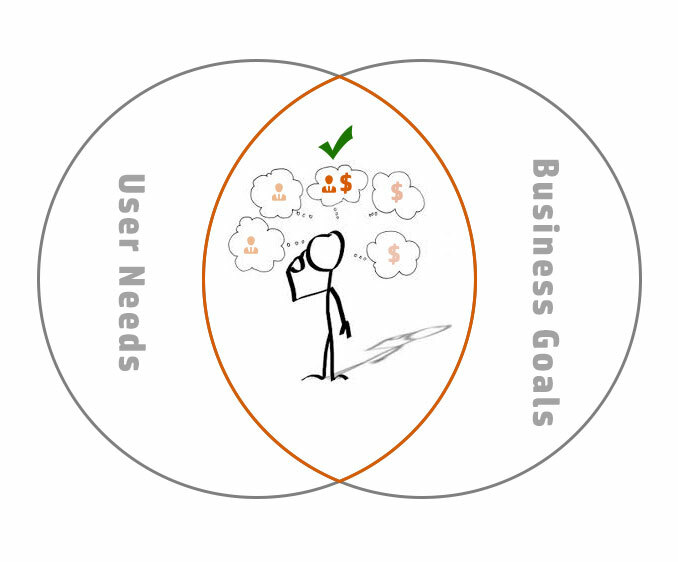 So, most important role of UX team is; to identify and fill the gap between user needs and business goals. Designer is paid by client but expected to be user advocate. Should “balanced experience” be right name of user experience. Because as a UX person we look at not only user needs but also business goals, technical constraint, budget scope, resource availability etc. Conflicts are obvious, and expectation is; perfect solution with balanced experience that satisfies both user need and business goals. For example, client wants to display certain ad/information or capture certain demographic details using a popup when user is engaged on a task. It’s a bad user experience from UX team perspective. But it’s a business need. Since we understand the requirement is justifiable, we have to do this; but how we achieve this without hampering the user experience; is our job. Anything that is suggested by client, need to be taken as a requirement not as a direction. If client is saying, use a popup. It doesn’t means popup is the only way to display or get the information. If project is directed merely one direction like, blindly doing what client is saying; or solely doing what users want, will lead to the failure. Understanding client’s business is important to deliver the balanced experience. A beautiful and user-friendly product is useless, if it is not generating any business values.